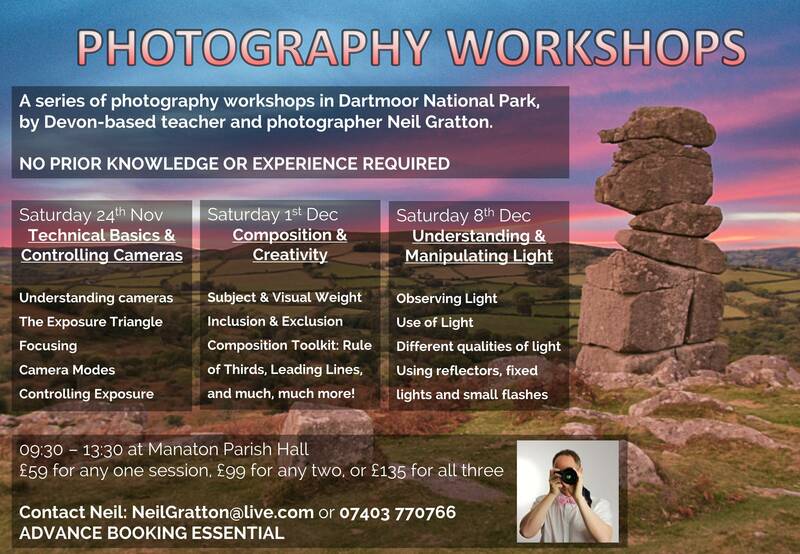 I’ll be running a series of photography workshops in Dartmoor National Park, Devon, this Autumn. Aimed at new photographers, three sessions will cover all the skills you need to use your camera effectively, capture well-composed scenes, and make good use of light and lighting. We’ll look at controlling DSLR and Mirrorless cameras, but you don’t require one to participate. The workshops will take place on Saturday mornings, on 24th November, 1st December and 8th December. I’m a qualified teacher, and work part-time as a photographer. I shot my first wedding commercially in 2013, and am frequently busy as an events photographer. My pictures have appeared on the BBC and in The Telegraph. I also shoot landscapes for fun and occasionally even sell a few. Contact me to book or find out more.